A long time ago I realized that there was no point in denying the influence of my parents on my musical tastes, especially my love for live music. And in my early twenties, I started asking my parents questions about…who they were when they were young, why they made the decisions they did and other important details about their lives that I didn’t already know the answers to. During my inquisitive quest, I got to know more about my dad’s love for Neil Diamond. And sadly, last Monday my dad, Joe Catania, passed away at the young age of 60. And like we’ve done for other live music fans who’ve passed on, this post is a tribute to his life and especially his love for experiencing Neil Diamond live in concert. 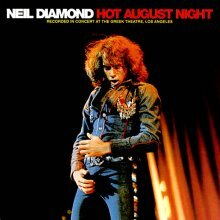 38 years ago today, Neil Diamond recorded his legendary live album Hot August Night at the Greek Theater in Los Angeles. I don’t know if my Dad had it in mind, or if God saw it as a proper time to call my Dad home, but in any case, I’ll always associate that live recording with my Dad’s passing because they happened within a week of each other. And the other reason I’ll always remember that recording, is because it was on that tour that my dad had one of his most memorable, maybe even his all-time favorite, concert experience, as my Aunt Rosie, his sister, reminded me when I asked her to help me fill in some blanks for the Father’s Day Festival earlier this year. What Did I Learn From My Dad’s Love For Neil Diamond? That’s a question that I continue to answer everyday. And when I was preparing my notes for the speech I gave during my Dad’s memorial on Friday, I read the liner notes from one of my Dad’s favorite albums, Neil Diamond’s Stages , an anthology of all his live shows from *1970 -2002. In the liner notes, Diamond shares a lot of interesting and appropriate insights about human emotion, life and the power of live performance for fans and artists alike. So here’s a couple snippets that made me think about the connection between my Dad’s love for live music, Neil Diamond’s love for performing live and my curiosity for understanding what it was like for my Dad to experience Neil Diamond live when he first saw him in the 70’s. …But there’s one thing that hasn’t changed…, and that’s the excitement I feel about performing live. Taking the stage is as palpable and seductive for me today as it was back then. The trill of the unknown, the new, the unpredictable is still as inspiring and welcome to me after all these years…. …Listen in then, as I revisit the stage of my life and my performances. From tiny folk clubs to immense arenas and stadiums, I have been afforded my lessons in humility and in “the kindness of strangers.” I have learned the value of an unexpected journey to an unknown place in the heart. Like those words, I wrestled with a complex mix of emotions. I struggled with loss while I also celebrated and found joy in looking back and reflecting on my Dad’s life. Yes, I could feel my Dad’s spirit in the music as the tracks from Hot August Night flowed through the speakers and made my eyes well up and put a smile on my face. And like a Neil Diamond concert, the emotion was raw and undeniable as I gave my speech and looked out into the eyes of those in who came to the memorial. And for those very reasons, I will never listen to any Neil Diamond song in the same way ever again. And like I told Frank from Windy City Rock when he asked me who I’d like to see live, I do hope to someday experience Neil Diamond live in concert so I can complete my quest. As you have probably guessed, music (live and recorded) is a huge part of my life. It helps me cope, celebrate, understand and most of all it helps me connect with people on this Earth and to those who have passed on. 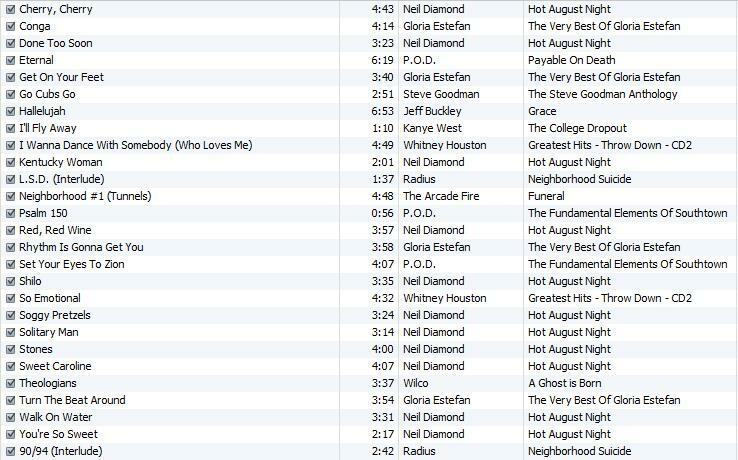 So, to wrap up this tribute I’d like to share a special playlist with you in screen shot below. When I created the playlist to for my Dad’s memorial I carefully and proudly chose a mix from what I like to call my Dad’s Musical Trilogy: Neil Diamond, Gloria Estefan and Whitney Houston. He had many other favorite artists, but usually one of those three was likely to be playing on the stereo when ever my dad was around. Besides those artists, I also mixed in a few of my own personal picks that have special meaning to me for myriad reasons. I hope you enjoy the playlist and found comfort in this tribute. Thank you for traveling through this post with me and feel free to ask any questions and add your own picks in the comments below. Rest in Peace Dad. We will miss you.